Guru Nanak Nishkam Sewak Jatha Leeds received the Best Outreach and Networking Award at the Fairtrade Supporter Conference in October 2013. It was presented by Fairtrade International Chief Executive Michael Gidney CBE. The Award recognises the achievements and creativity of Fairtrade campaigners and supporters for helping workers and farmers in some of the poorest countries to earn a decent living and secure a better life for themselves. Smallhold farmers produce 70% of the world’s food but also make up half of the worlds hungriest people and we want to change that! We were awarded £500 which we’re going to use this year to spread the Fairtrade message even further in our campaign to bring a fair wage to farmers and workers. During Fairtrade Fortnight members of GNNSJ-Leeds took part in a number of events where we showcased Fairtrade products, talking to the local community and explaining Fairtrade to hundreds of people. To support this we created Punjabi Fairtrade literature our own campaign material to highlight the links between Fairtrade and the Sikh faith. We are just one of many campaigner groups helping to raise awareness and becoming actively involved in supporting the millions of people who grow the food we love. But it’s more than just paying these farmers a fair price for the products they grow. It’s about decent working conditions, building sustainable businesses and ultimately empowering people to help themselves out of a life of poverty and into a world where they can make a decent and dignified livelihood. Just like Guru Nanak Dev Ji’s teachings, Fairtrade believes that everyone should be able to earn an honest living, one that is free from exploitation and unfair restrictions. Guru Nanak Dev Ji himself taught us this very message when he refused to eat from the hands of the wealthy Malik Bhago who earned his living through dishonesty and exploiting the poor. Instead Guru Ji chose to eat with Bhai Lalo a poor man who earned an honest living. Guru Nanak Dev Ji’s message was one of earning through an honest living and being compassionate towards others. 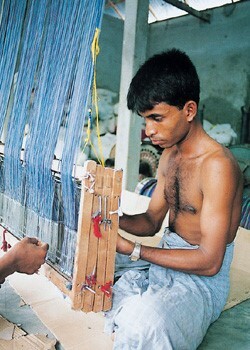 Similarly Fairtrade strives to help people support themselves through an honest living and prevents them from being exploited by the likes of the modern day Malik Bhago. So what can we do? You’ll notice the Fairtrade logo on a huge variety of products in your local supermarket like tea, coffee, sugar, chocolate, fruit, jam, honey and even clothes. These items come from smallhold farmers in countries like India, Kenya, Brazil and Nepal and many more. Everytime you buy something with a Fairtrade label you are choosing to give people an equal chance to survive. Everyone can play a part. You don’t have to be an expert on issues of campaign you just need to care enough to buy some Fairtrade goodies. It’s that simple. Next time you go to the supermarket, make a swap from one of your usual items to a Fairtrade one. This way you know that farmers are getting a fair price. Swap from your usual bananas to Fairtrade ones. Buy Fairtrade bananas for your local Gurdwara. Make Foncho’s banana campaign famous by telling other people about it. Raise awareness of Foncho’s banana campaign by holding an event or just putting up some posters and leaflets. Congratulations! You have just joined over 1.5 million steps towards Fairtrade. 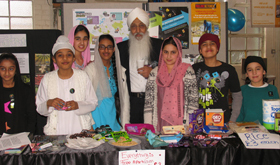 Here’s the sangat at a Leeds Guru Nanak Nishkam Sewak Jatha Gurdwara holding a Fairtrade stall during last year’s Fairtrade Fortnight. or email abirdi@live.co.uk for more info on getting your Gurdwara involved.